New times call for new business models: Local communities unite to invest together and share services. Governments try to find ways to spend less but have more positive effects. Business is adapting their services to lower environmental footprints and resources use. We are all looking for new ways to bring value to a world that is fundamentally different from what it was just a decade ago. How can you take advantages of this? How can you organise and optimise this value? Except has more than a decade of first-hand experience with innovative business cases. We have organised ourselves accordingly, have set up other organisations and created new products with this mindset. We know the methods that are being tried, their ins and outs, and help to innovate on new business models to bring our clients further ahead. There are numerous empty office buildings in every city. Many of them won't see any revenue or use in the coming years under old business models. For empty buildings we develop new models to make them useful, attractive and create revenue. For this, we look at the local context and need for services, the building structure, and extrapolate future scenario's. We then use our team of experts to invent a customized business model that fits that location specifically. In the heart of Western Europe’s largest port city lies the Rotterdam Collective. One floor houses 20 companies, each with its own unique field and specialisation. There are typographers, game designers, event organisers, architects, agricultural planners, journalists, and more. 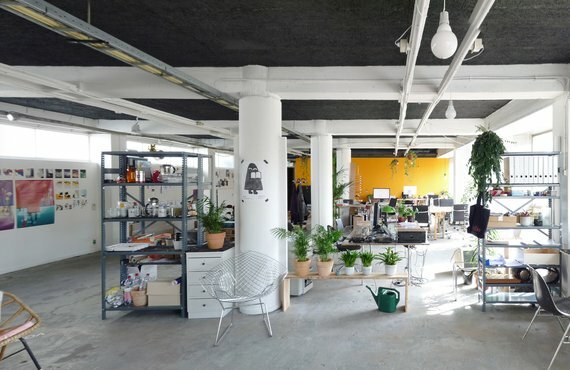 The Rotterdam Collective is set up explicitly to offer each of these companies a stimulating work environment and, above all, to facilitate collaboration between these companies. Ro-Co is housed in a building that previously stood empty for over a decade. The new model makes the space attractive and create revenue. We can help you reach your goals in these changing times. We can help you organise and develop new business cases. We can co-develop new products and services with you. We can work on a consulting basis or potentially in (co-)business development.